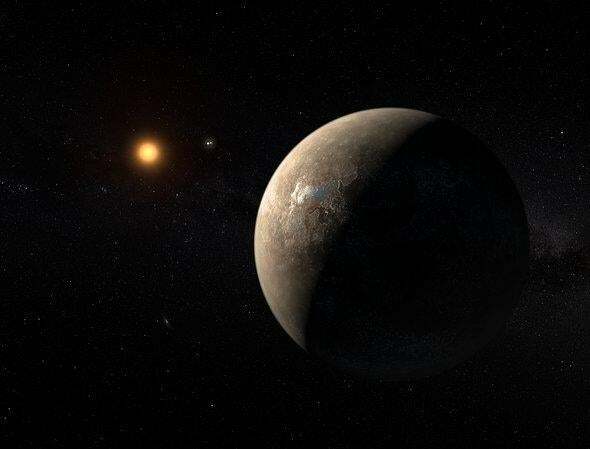 Artwork depicting Proxima Centauri b, orbiting a red dwarf (that itself orbits the binary star Alpha Centauri) more than four light-years away. There’s no other way to phrase it. This is HUGE news: Astronomers have found a planet orbiting the Proxima Centauri, the closest star to the Sun! The planet, called Proxima Centauri b or just Proxima b (exoplanets are given their star’s name plus a lower case letter in order of discovery, starting with “b”), orbits Proxima every 11.2 days. It has a mass of no less than 1.3 times the Earth’s, so if it’s rock and metal like Earth it’s only a bit bigger. It’s a mere 7.3 million kilometers from the star—a lot closer than Earth’s distance from the Sun of 150 million kilometers!—but Proxima is so faint and cool it receives about two-thirds the amount of light and heat the Earth does. That means that it’s in Proxima’s habitable zone: It’s possible (more or less) that liquid water could exist on its surface. Did I mention wow? Because wow. There’s some backstory here, and it’s very cool. Proxima Centauri is only 0.14 times the diameter of the Sun and 0.12 times its mass. Its surface temperature is much lower, so it’s cool and red, what we call a red dwarf. It orbits a binary star called Alpha Centauri, made of two stars more similar to the Sun (so the whole system is a trinary star). Proxima is pretty far out from the pair, about 0.1 light-years or so (a trillion kilometers), about 200 times farther than the distance of Neptune from the Sun. So it’s nearly out by itself in space, barely bound to the binary. The Alpha Centauri binary is easily visible from Earth’s Southern Hemisphere, though they look like one star at their distance of about 4.3 light-years, and are among the brightest stars in the sky. Proxima, even though it’s closer to us, is so intrinsically dim that you need a good pair of binoculars to see it at all. Because it’s the closest star to the Sun, astronomers have looked at it for decades to see if there’s any evidence of a planet. There have been false alarms over the years, all eventually shown to be errors. But this time it looks like it’s very much real. The difference is the quality of data, because our technology and techniques have improved mightily recently. Using two different cameras on two different telescopes, the astronomers divided the light from Proxima into a spectrum showing many individual colors. They looked for subtle and periodic changes in the spectrum that would be due to a planet orbiting the star. As the planet moved, it would tug on the star; Proxima would make a little circle as the planet made a bigger one. This creates a Doppler shift in the spectrum, which in principle can be measured. The faster the planet orbits, the bigger the shift, and usually the easier it is to detect. The motion Proxima b imparts on its star is very small, just one or two meters per second. * That’s very hard to detect. But the eyesight of the cameras was sharp, and the ability of the astronomers to tease out the signal greater. By using other telescopes to observe the star, they were able to account for any change in the star’s brightness that could masquerade as a planet, confounding the results. In the end, the signal from the planet’s motion came out pretty clearly. I have to admit, it looks pretty solid to me. That’s important to me: A few years back a planet was announced orbiting one of the stars of Alpha Centauri, which was very big news. But later it was found to be a spurious signal, and in reality no planet was seen. Planet discoveries get retracted every now and again, especially ones where the signal is faint. In this case when I heard the news I was pretty skeptical, but after reading the paper it looks good to me. I’m satisfied the planet is real. There are some caveats, though. For one, we can’t know the true mass of the planet. If we see the orbit edge-on then it has a mass of 1.3 times the Earth. But if the orbit is tipped, the mass has to be greater to cause the star to wobble as observed, and if the orbit is tipped by 45°, say, the planet’s mass has to be 40 percent bigger. If it’s tipped more, the planet has to be even more massive. We’re not sure of the shape of the orbit. It might be elliptical (aficionados of exoplanets take note; the eccentricity is no more than 0.35), or it might be circular. But either way, it’s at the right distance from Proxima that, given reasonable assumptions about the planet’s composition, it could have liquid water on its surface. This calculation has a lot of caveats—its temperature without an atmosphere would probably be around -40° C, but Earth’s average temperature without the greenhouse effect is only -15°. So yeah, cold, but if it has enough CO2 or other greenhouse gases in the air (assuming it even has air! ), it could be clement there. If so, that makes it not just the closest exoplanet known, but the closest potentially habitable one known. 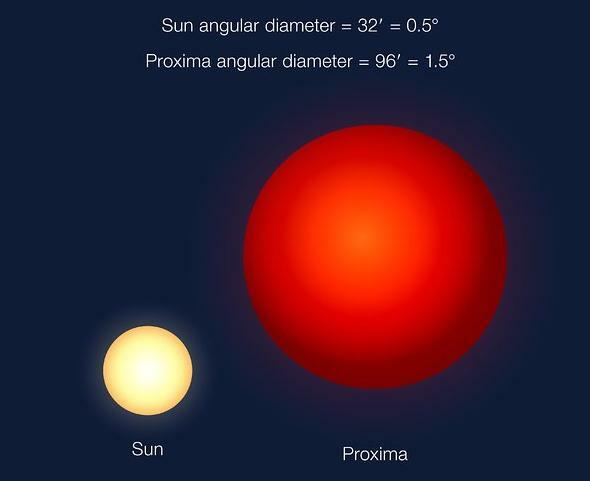 Although Proxima is about 1/7th the size of the Sun, Proxima b is so close to it the star would appear three times bigger in the sky than the Sun does from Earth. Mind you, we know nothing of its composition, or even its size. It may be completely uninhabitable, or it might be Eden. There’s no way to know. So be cautious here: It’s likely to be Earth-size, but we don’t know if it’s Earth-like. Either way, it’s more than 40 trillion kilometers away, so we’re not going there any time soon. The fastest spacecraft we’ve ever launched would take many tens of thousands of years to get there. Don’t pack your underthings just yet. Still, this is terribly, terribly exciting. We’ve only known for sure about the existence of exoplanets—worlds orbiting alien suns—since 1992. The first found were orbiting a dead star, a pulsar. The first planet orbiting a Sun-like star wasn’t found until 1995, and in the next two decades we built telescopes dedicated to looking for them, and as of today we know of over 3,000 such strange, new worlds. Quite a few are Earth-size, and fewer possibly Earth-like. Still, we can make estimates that there are billions of Earth-size planets in the galaxy. And now we know that it’s possible that the nearest one is, on a cosmic scale, right next door. People say that it’s a curse to live in interesting times. But with science, it’s not. It’s amazing. *Correction, Aug. 24, 2016: I originally misstated that this was the speed the planet goes around the star, not the speed of the star itself. The velocity of the star as it moves in a small circle is much smaller than the velocity of the planet, which is making a much bigger circle in the same amount of time.